Hangaram Museum simultaneously proposes two exhibitions with similar titles : "Dream and reality" and "Dreams come true". 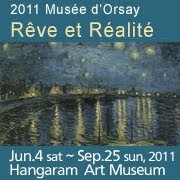 If you don't mind, I won't elaborate on the latter (devoted to "The art of Disney's classic fairy tales" - May 14 - September 25, 2011), and focus on the former : "Reve et Realite" will display for the first time in Seoul masterpieces from the Orsay Museum (June 4 - September 25, 2011). Also on display this Summer in Seoul : Monet, Van Gogh, Renoir, Ingres, or Millet, and series of drawings. A former train station facing the Louvre and Tuileries gardens from across the Seine river in Paris, Musee d'Orsay hosts collections from the XIXth and XXth centuries, including embarrassing series of academic art ('art pompier') but also countless treasures. I can't believe this museum will turn 25 later this year.